ESCO (Equipment Supply Company) is pleased to announce the new Heavy Duty “HD” Adjustable Wheel Dolly [Model #70134]. The HD Adjustable Wheel Dolly is designed to assist service technicians as they move through the tire/wheel service process. 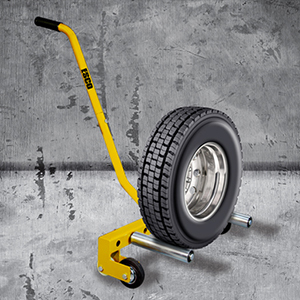 Its lightweight, portable, and adjustable design makes it an ideal tire dolly for any service shop. With a tire width handling capacity of 24.5” it makes it ideal for use on a much larger range of tire/wheel assemblies. The HD Adjustable Wheel Dolly completely eliminates the need to lift and move any large and heavy wheels by easily rolling the unit up to the wheel and rolling it away and onto the vehicle. In addition to saving on labor and time, using the wheel dolly will also allow for saving an accidental damage to expensive rim while servicing. The HD Adjustable Wheel Dolly [Model #70134] is available now wherever ESCO products are sold. For more information about this product and where to buy ESCO product email sales@esco.net or call 1-800-352-9852 or visit www.esco.net and search “HD Adjustable Wheel Dolly”.